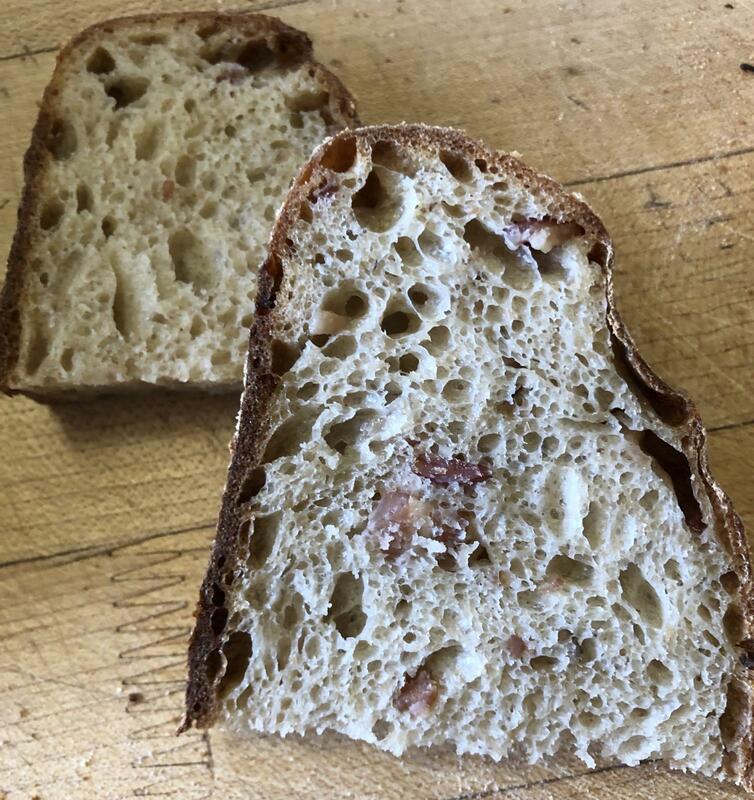 Ken Forkish has a Pain au Bacon that I used to make a few years ago. My daughter mentioned that I hadn’t made any in quite a while so it was time to revisit adding bacon to bread and adding caramelized onions for good measure. As to the caramelized onions, I make a huge quantity in a crockpot and freeze them in ice cube trays. This comes in super handy since caramelizing onions is normally such a long process. Extra bran and AP flour to feed the Levain. Cook the bacon until fairly crisp and crumble it. I cooked mine in the oven to make the process a bit easier. Crumble, cover and reserve. Mill the buckwheat groats for the main dough and place in a tub. Mill the Red Fife and durum berries and sift to obtain the needed amount of high extraction flours. Place the required amounts in the tub with the buckwheat flour. Save the bran for feeding the levain. Reserve the leftover high extraction flour for feeding the Levain in the evening and the next day. Add the unbleached flour to the tub. Cover and set aside. Early in the morning, feed the levain 72 g of filtered water and 72 g of durum/AP flour and let rise 4-5 hours in a warm spot. Two hours or so before the levain is ready, put 825 g filtered water in a stand mixer’s bowl and add the flours from the tub. Mix on the lowest speed until all the flour has been hydrated. This takes a couple of minutes. Autolyse for a couple of hours at room temperature. Remove the caramelized onions and bacon from the fridge and leave on the counter to come to room temperature. About half way through the final five minutes, add the caramelized onions and the crumbled bacon. Do 4 sets of stretches and folds at 30 minute intervals, then do two more sets on hourly intervals. Immediately after the last fold, place the dough in the fridge for 4-5 hours. I was gone for 5 hours. The dough rose ~75%. Tip the dough out on a bare counter, sprinkle the top with flour and divide into portions of ~810 g. Round out the portions into rounds with a dough scraper and let rest 60 minutes on the counter. Do a final shape by flouring the rounds and flipping the rounds over on a lightly floured counter. Gently stretch the dough out into a circle. Pull and fold the third of the dough closest to you over the middle. Pull the right side and fold over the middle and do the same to the left. Fold the top end to the center patting out any cavities or big bubbles. The dough was very poofy! Finally stretch the two top corners and fold over each other in the middle. Roll the bottom of the dough away from you until the seam is underneath the dough. Cup your hands around the dough and pull towards you, doing this on all sides of the dough to round it off. Finally spin the dough to make as tight boule as you can. Sprinkle half rice/half AP flour in the bannetons. Place the dough seam side down in the bannetons. Cover with plastic bowl cover or shower caps. Let rest for a few minutes on the counter and then put to bed in a cold (38F) fridge for 8-9 hours. I just had an idea for when I do this again. Perogy Sourdough! I just need to add some mashed potato and some old cheddar cheese, and there you go! Hum... This might happen sooner than later! Just a terminology quibble: I wouldn't normally call a 66% flour "high-extraction". The highest-extraction flour is 100% whole wheat; the lowest extraction includes super-white cake flour and that type of thing. Are "high" and "low" maybe reversed? Or have I misunderstood, and 66% IS high extraction in a home-milling situation? when I haven’t stated how much bran I sifted out? 100 g flour from 150 g durum? 100 g flour from 150 g durum? Or am I missing a step in the process? flour for the levain. So out of that 150 g of durum, I use 100 g of the sifted flour for the dough, and the rest of the sifted flour goes into the levain. 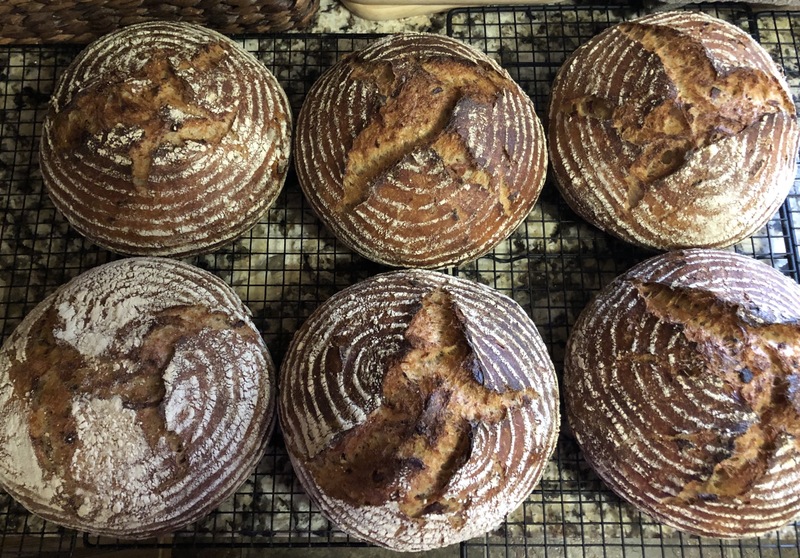 I make up whatever I am short for the Levain with the baker’s flour. The bran goes into a container where I collect it and only use 18 g for the levain’s first feed. I use the remainder to feed my NFNM starter in the fridge or I make bran muffins with it. It doesn’t go to waste. I baked the forkish bacon bread and the house smelled like a great slow cooker pork bbq roast !! I bet this bake must have made the house smell amazing! This one sounds like it's going to taste amazing. Danni, your bakes are so consistently beautiful! I can smell it all the way here in Montreal! I figured you might have a recipe up your sleeve for a rosemary SD bread. I’d like to bake one for Easter next week, and for my Easter the following week, or a different version with rosemary. No milling, just flour I can get my hands on, preferably with some white kamut. I’d love to make this one, but my daughter-in-law’s father can’t eat anything with cooked onions, and my 3rd son’s girl friend is vegetarian so no bacon. Anyone else is welcome to jump in here! I can create one for you! How many loaves do you want this recipe to make and how big do you want the loaves? Would you like a soaker in it like oats? Or a plainer bread like a pain de Campagne with just rosemary as an add-in? Oh one more question: Are you going to use a mixer or do it all by hand? So I was thinking of making one boule with rosemary, one with olives, actually. I'm thinking more of a plain pain de campagne type - no soakers this time. Size - we will be about 10-12 people - 800g each - around that. I would want to work with 100% hydration starter for this one. I've started using my mixer with the recent bakes and I might want to stick with that. My arm flares up from time to time when I get into mixing the dough. Have I missed anything? This is fantastic. A million thanks! Just emailed you with another comment. Hi Danni, so not to hijack this thread I have sent you an email. can’t find it, here it is again. Oh and no worries about high jacking! This recipe makes two loaves of around ~800 g. I am giving you the option of having one with rosemary and olive oil, and doing the other one with olives in it. Otherwise don’t divide the dough until the preshape. On dough making day, I usually start around 8 to 9 am but then again, I am dealing with 4 batches of dough. I think you should be okay if you start around 10 am. 2 pm Add salt, oil, rosemary and levain. Mix total of 6 minutes. 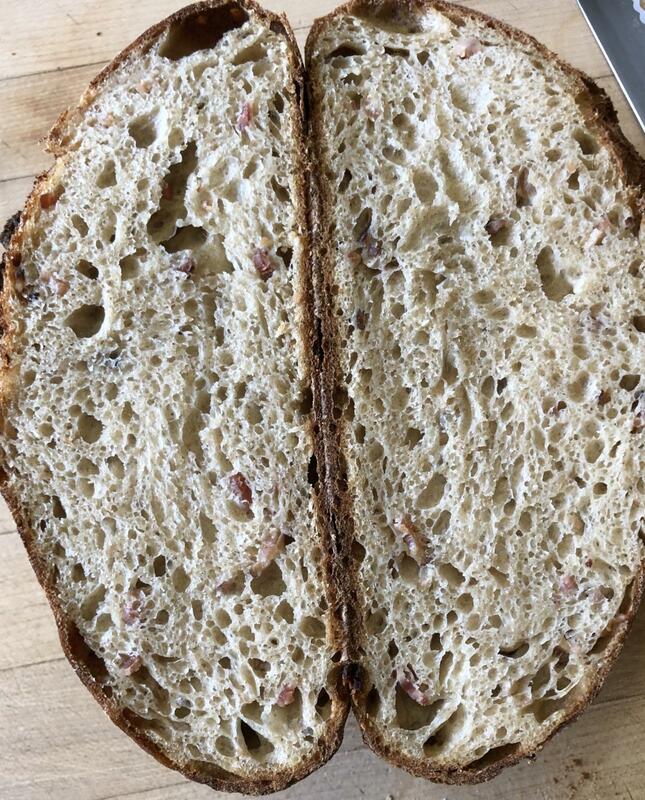 Divide if making two different breads. 9:15 pm Divide if only making one kind and preshape. 10:15 pm Do final shape, put in bannetons, cover and back into fridge. 8:15 am Bake according to instructions. If your oven has convection capabilities, use that mode. Take 12 g of refrigerated starter and feed it 12 g of filtered water and 18 g of white kamut flour. Let rise in a warm place. Before going to bed, feed the levain 24 g of water and 24 g white kamut flour. Let that rest in a warm spot overnight. Finely chop up the fresh rosemary and save in the fridge. Place the water first, then the oats, the unbleached flour, the white kamut flour and the rye flour in the mixing bowl of your stand mixer. Mix on the lowest speed until you have a shaggy dough with no dry spots. This takes a couple of minutes. Autolyse for a couple of hours at room temperature. Once the levain is ready, add the salt, the oil, the fresh rosemary, and the levain to the bowl. Mix on the lowest speed for a minute to integrate everything, then mix on the next speed up for 5 minutes. Remove dough from bowl and at this point, if you are making a pure rosemary loaf and a rosemary olive loaf, I would divide in two and place in two covered tubs. If not, just keep the dough together in one tub. Let rest 30 minutes in a warm spot (oven with the door cracked open and the lights on). If you are using the olives, add them during your first set of folds to the one portion of dough. For the first set of folds, I keep stretching and folding until I feel the dough tighten up. The other sets are done when I have gone around the tub completely. The dough usually tightens up fairly quickly. Be gentle for the last two sets. Do 4 sets of stretches and folds at 30 minute intervals, then do two more sets on hourly intervals. After the last fold, place the dough(s) in the fridge for 2 or 3 hours. It can be in there longer if you need it to be. Tip the dough out on a bare counter, sprinkle the top with flour and divide into two if you haven’t done so already. Round out the portions into rounds with a dough scraper and let rest 60 minutes on the counter. Do a final shape by flouring the rounds and flipping the rounds over on a lightly floured counter. Gently stretch the dough out into a circle. Pull and fold the third of the dough closest to you over the middle. Pull the right side and fold over the middle and do the same to the left. Fold the top end to the center patting out any cavities or big bubbles. Finally stretch the two top corners and fold over each other in the middle. Roll the bottom of the dough away from you until the seam is underneath the dough. Cup your hands around the dough and pull towards you, doing this on all sides of the dough to round it off. Finally spin the dough to make as tight boule as you can. I must say that the dough felt super nice! Sprinkle half rice/half AP flour in the bannetons. Place the dough seam side down in the bannetons. Let rest for a few minutes on the counter and then put to bed in a cold (38F) fridge for 9-10 hours. The next morning, heat the oven to 475F with the Dutch ovens inside for 45 minutes to an hour. Turn out the dough seam side up onto a cornmeal sprinkled counter. Place rounds of parchment paper in the bottom of the pots, and carefully but quickly place the dough seam side up inside. You’re the best! I’ll keep you posted on the results with photos as well! Thanks a million. Going to print it out now!